Each year The Fairfax Network creates programming for educators to use in the classroom, and for public television stations and cable systems. The lineup includes quality K-12 enrichment, parenting, and staff development programs. Many of the shows come with additional resource information, teacher guides, and classroom activities created to fit seamlessly into the curriculum. During the half-hour interactive program, authors describe their approach to the writing process, talk about character development, and sometimes share a sneak peek at their books not yet published. During live programs, students call in with questions, inspiring lively and impromptu responses from the authors. The connection established between authors and students brings the process of reading and writing to life. As a result, students are motivated to read new books, write their own stories, practice the art of illustration, and find and establish their places in a reading and writing world. 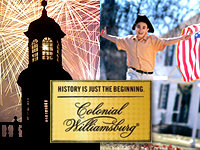 Colonial Williamsburg’s classroom materials and programs are developed by teachers, museum professionals, and historians. Electronic Field Trips are designed to meet grades 4–8 state standards in social studies, language arts, arts education, and library/technology literacy, and science (when applicable). These materials and additional Colonial Williamsburg classroom resources are also correlated to National Standards in History Education, National Standards for Civics and Government, and 21st-Century Skills. Among explore's founding principles are “Share What You Know” and “Never Stop Learning.” The films profile issues facing the environment, education, human rights, public health, philosophy, animal welfare, spirituality, and disabilities. The lesson plans accompanying explore’s films are written for use in the K – 12 classroom and are connected to grade level national standards. Background information about the non-profit organizations is provided along with questions for guided discussion about the films. The questions are intended for students to connect to the people and issues profiled by exploring and developing their own viewpoints and opinions. Enjoy exploring the minds of the people who will solve many of the issues profiled in these films.